(Nanowerk News) The project at the Luleå University of Technology to recycle cellulose sludge, for production of cellulose nanofibres is now proving to be an economic and environmental success. For example, at one single cellulose manufacturer, Domsjö Fabrikerna in Sweden, the producer of special cellulose, which is used to in the manufacturing of viscose fibers, causes one thousand tons of sludge as a residue each year. In the current situation the sludge is not re-used. It is this industrial residue, that is of interest for one of the research teams at the Luleå University of Technology. This project to recycle cellulose sludge, for production of cellulose nanofibres is now proving to be an economic and environmental success. 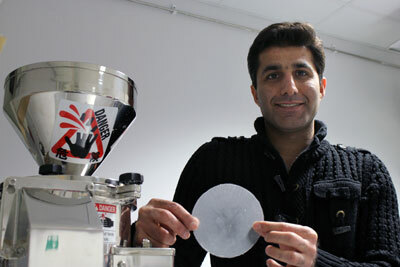 "This is definitely the best result we have had in producing nanofibres from different bio-residues. Presumably, this is a very profitable production, that more cellulose industries should take an interest in," says Kristiina Oksman, Professor at the Luleå University of Technology. Mehdi Joonobi, Post Doctor at LTU. A few years ago, cellulose industries in Sweden, disposed some of their waste as sludge into the ocean. It is now prohibited, and the sludge is stored in large tanks on land. This particular cellulose sludge makes it possible, to produce, so far, the most profitable production of cellulose nanofibres from bio-residue products. The yield of the manufacture of cellulose nanofibres from the sludge is 95%, compared with cellulose nanofiber production from wood chips 48%, lignin residues 48%, carrot residues of 20%, barley 14% and grass 13%. "The separation of cellulose nanofibres from bioresidues is energy demanding but when we separate the waste from Domsjö, the energy consumption is lower. The special cellulose from Domsjö has very small size and it also has high cellulose content and therefore the fibers do not need to be chemically pre-treated before the production of cellulose nanofibers," says Professor Kristiina Oksman. The outcome of the re-use of this sludge, can be for example cheaper and more environmentally-friendly milk cartons and other paper and packaging products. This research is part of the project Bio4Energy. "Our goal in this project is to create new materials, use residues and thereby increase the value of the whole production chain. Now, Smurfit Kappa have also shown interest for us to investigate the conditions for their cellulose sludge," says Kristiina Oksman. Cellulose nano-fibers, manufactured from this sludge, are probably shorter than the cellulose nanofibers made from pulp but are finer and can form dense films with excellent barrier properties.